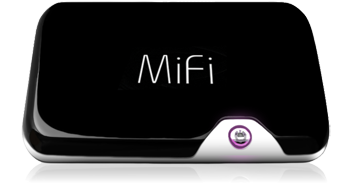 MiFi gained a lot of attention these days, dubbed the main reason for the problems at the presentation of iPhone 4. It is a convenient way to have mobile internet everywhere with you. It is a compact wireless (Wi-Fi) router, which uses a cell-phone network (3G) for internet connectivity. The concept is several years old, with traditional WiFi routers’ manufacturers implementing a GPRS/EDGE/UMTS/CDMA modules in some of their products. These routers are very convenient for setting up mobile sites like mobile teams, outdoor events, etc. where only the presence of electricity is needed. Like traditional routers, they usually offer combined wired and wireless access. MiFi is an enhancement of this concept – it’s a self-sufficient device, designed by Novatel, that has its own battery. You can carry it in your pocket or bag, and use wireless internet about 10 meters (30 feet) around. The battery has enough capacity to provide about 5 hours of active internet access and 40 hours of standby. It automatically switches into standby when it detects it is not in use, thus saving power. It can be accessed by 5 devices simultaneously (wireless only, no wired ports), sharing the same internet connection. And when the battery is down, you can plug it in an electricity outlet with the provided adapter, or charge it from your laptop via USB, to continue surfing. This entry was posted on Wednesday, June 16th, 2010 at 16:38	and is filed under Gadgets, Technology, Video. You can follow any responses to this entry through the RSS 2.0 feed. Both comments and pings are currently closed.